ALL ATTENDEES MUST FILL OUT A RELEASE FORM. Thank you. By checking box, I understand and agree that participation in Studio 4 Art classes and/or workshops and/or camps and/or party, is voluntary and that I assume all risks and voluntarily release, waive and relinquish any and all claims, causes of action and liability for any personal injury or property damage [actions] arising out of my participation in Studio 4 Art classes and/or workshops and/or camps and/or party, including any alleged negligence in the operation, machinery or maintenance of the property and facilities on which such classes and/or workshops and/or camps and/or party or volunteers, and/or employees harmless from and against actions, which arise out of, or in connection with my participation in the classes and/or workshops and/or camps and/or party. I give permission for my photo and/or artwork to be used in all forms of Studio 4 Art publicity, brochures and website. Studio 4 Art works with all themes and ideas. We have many of our own, if you are not sure. Any questions we can answer them in the comments, or when we call to verify your party. By submitting this form, you are granting: Studio 4 Art, 1133 Grant Avenue, Novato, CA, 94945, United States, http://www.studio4art.net permission to email you. You can revoke permission to mail to your email address at any time using the SafeUnsubscribe. SafeUnsubscribe® link, found at the bottom of every email. We take your privacy seriously. Party By checking box you agree: Full payment includes a non-refundable deposit of $50, due immediately to hold this reservation. A 30 day notice of cancellation is required to receive a full refund minus the $50 deposit. No refund for less than two week notice. Changing party dates will result in a $25 transfer fee, must be done no later than 14 days prior to original party date and is subject to availability. In the event that Studio 4 Art cancels the party date, you will receive a full refund. A party fee covers the art project(s) the use of the party room and instructor(s). Should you arrive early or stay later than 15 minutes beyond your above stated party time, you will be charged accordingly, $25 per 15 min. Time slots: Party hosts arrive 15 minutes early for set up. S4A also has a mobile art studio. $50.00 travel fee for outside of Marin County. Studio 4 Art will get all supplies ready for a successful and fun pARTy. *No instructor for in-a-box party. Pick up box in Novato or Mill Valley. clay sculptures, painting on canvas, t-shirt design, screen printing, mosaic frames, hand-sewn stuffies, relief printmaking, or special requests. Paint-it-yourself pottery also available. Price is the price of the bisque piece you choose, with a deposit for glaze. GREAT for ALL ages! Our Novato studio parties are appropriate for ages 2-adult. We can accommodate 8-20 children or 8-15 adults. The entire studio is yours with 1.5 hours of party time, and 15 minutes set-up. Choose any art material. Mosaics, Clay Sculpting, Wheelthrowing ($40 fee), Acrylic Painting, Printmaking, T-shirt design, Sewing, Collage and Drawing. Call to discuss any ideas you may have. • $275.00 for 8 children; $15.00 for each additional child. This includes all art supplies and instructor-led activity. Our Mill Valley studio is for our young creators and appropriate for ages 2-8 and can accommodate 6-10 children. The entire studio is yours with 1.5 hours of party time, and 15 minutes set-up. Choose any art material. Mosaics, Clay Sculpting, Wheelthrowing ($40 fee), Acrylic Painting, Printmaking, T-shirt batik, Sewing, Collage and Drawing. Call to discuss any ideas you may have. • $295.00 for 8 children; $15.00 for each additional child. Our San Anselmo studio parties are appropriate for ages 2-adult. We can accommodate 8-25 children or 8-15 adults. The entire studio is yours with 1.5 hours of party time, and 15 minutes set-up. There is an additional space for food to be served. Choose any art material. Mosaics, Clay Sculpting, Acrylic Painting, Printmaking, T-shirt design, Sewing, Collage and Drawing. Call to discuss any ideas you may have. Sewing Parties: ages 4-adult. We can create any pattern to fit your hand sewn stuffy theme! Clay Parties: ages 3-adult. Projects are age appropriate and we work with you to design the theme of your choice. Boxes, animals, creatures, masks, wind chimes, fairies/gnomes, etc. Wheel Throwing Party: $40 extra fee. Ages 5-adult. Each participant will create a wheel thrown piece and a small hand sculpted clay work. Painting Parties: ages 4-adult. Acrylic on canvas, Water color on canvas or 100% cotton paper. We work with you to create a theme for your party. Screen Printing Party: ages 3-adult. T-shirts, small tote bags, canvas backpacks, or 100% cotton paper. Print Making Party: ages 3-adult. Age appropriate techniques introduced from relief printing on foam to carving soft blocks. Adult Parties are great for many occasions. Girls night out, baby shower, bridal shower, family holiday fun time. Want to have fun without the little kiddos? Our parties are not just for kids. Reserve your party and bring drinks and food and friends. Studio 4 Art will supply everything else. And yes, we think wine is a perfect accessory to creating. A very fun night with friends! 1) Choose materials you would like to create in and an instructor will guide you step by step. a) designing and painting large platters. 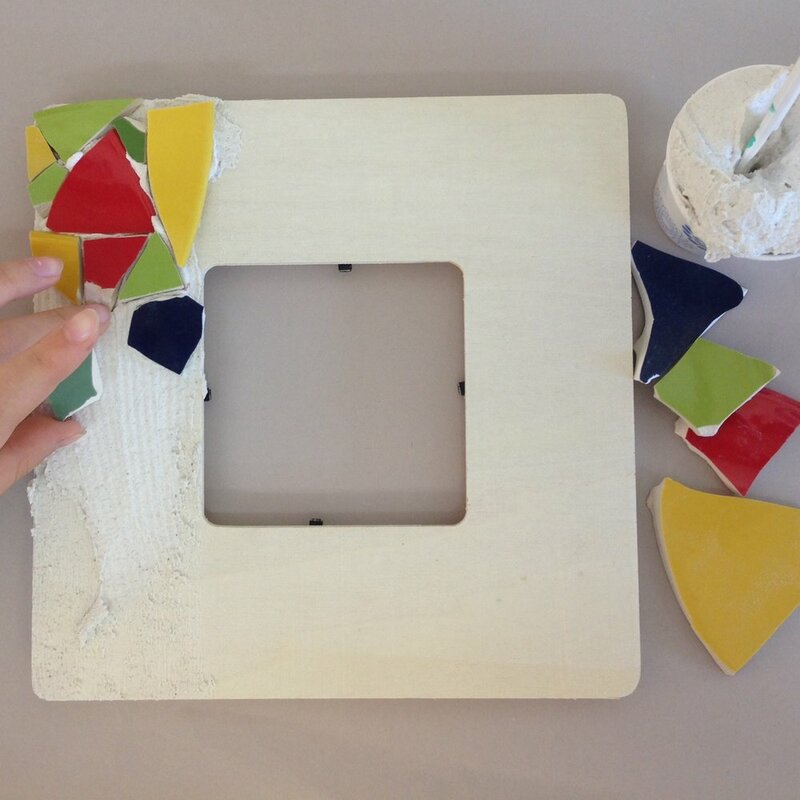 b) acrylic canvas painting c) mosaic mirror. 2) Paint your own pottery party: Have a night with friends with a pottery piece that you can use for years. Price includes a credit of $15 for each participant to choose their piece to be painted. Cost includes everything (glaze, firing, time). Discounts available for Cubs, Brownies, Scouts, Fundraising activities and other large events. Call to discuss ideas and cost - $12-$25 per participant, depending on what badge your troop is working towards. Please let us know the dates and times you are interested in. Call for quotes on pricing.